I already shared the story about my zucchini crop this year, so now it’s a perfect time to share a zucchini recipe. I was thinking of posting a Zucchini Bread recipe, but I have been baking a lot lately, so a vegetarian dish sounded more appealing to me. My sister might like this recipe as well, since she just told me that she is contemplating becoming a vegetarian. I could be a vegetarian most of the time, but I think I occasionally would miss my poultry and pork dishes. My mom loved zucchini sauteed with butter, onions, garlic, and some Italian spices. 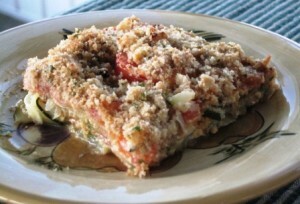 Today I will share this yummy recipe for Zucchini Casserole with tomatoes, cheeses and Italian spices. One recipe fills a 9 x 13 inch casserole dish. In a large bowl, combine the Cheddar Cheese, Parmesan Cheese, oregano, garlic, salt and pepper. Grease the casserole dish, or spray with a cooking spray. Divide the sliced zucchini and sliced tomatoes into two equal parts. Arrange the first half of the zucchini slices in the casserole dish, covering the whole bottom. Sprinkle 1/4 of the cheese mixture over the zucchini layer. Arrange the first haft of the sliced tomatoes over the cheese sprinkled zucchini. Sprinkle 1/4 of the cheese mixture over the tomato layer. Repeat the zucchini, tomatoes, cheese, layers again. In a medium sauce pan, melt the butter, over medium heat. Add the chopped onions and cook, stirring frequently, until translucent (2 minutes). Add the seasoned bread crumbs, and mix until the butter is totally absorbed and onions are mixed in. 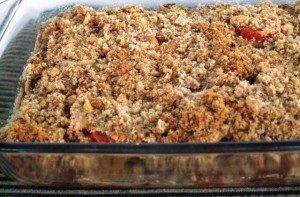 Preheat the over to 375 degrees F.
Sprinkle the bread crumb mixture evenly all over the top of the casserole. Uncover and bake for 20 minutes longer. Best served fresh, while the topping is nice and crunchy. Still tasty the next day, but the bread crumb topping is picking up moisture from the veggies. Thanks for the recipe. I will make it tonight. I bought tons of zucchini at the farmers market last weekend and need to cook it. I made an awesome zucchini bread yesterday. That is a good timing….I hope you like this casserole as much as we did. Zucchini bread sounds wonderful. It also freezes very well. My husband who is also not crazy about zucchini LOVED the recipe. I halved it because I used it as a side dish to our meal. I am so happy to hear that you enjoyed this recipe. Thank you for sharing your recipe modification of using canned tomatoes, instead of the fresh ones. This looks yummy! Your garden zucchini from a few weeks ago was so good, I definitely have a craving to try this recipe on some local NJ soon, while it’s still in season! It actually was quite tasty. Something different, than just the good old steamed veggie, or sauteed ones. The tomatoes added a little zest to the rather plain zucchini.